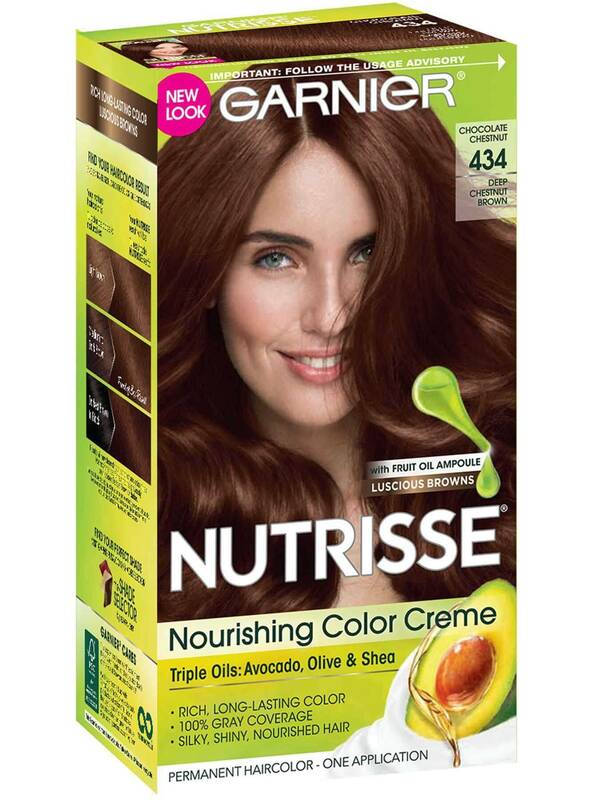 Garnier Nutrisse hair color creme nourishes with grape seed and avocado oil. The nourishing color creme enriched with fruit oil concentrate, penetrates deep into hair fibers to nourish and condition your hair so it takes color better and holds it longer, root-to-tip. Garnier Nutrisse delivers rich, long-lasting color with 100% gray coverage. Is Shade 434 (Chocolate Chestnut) right for you? 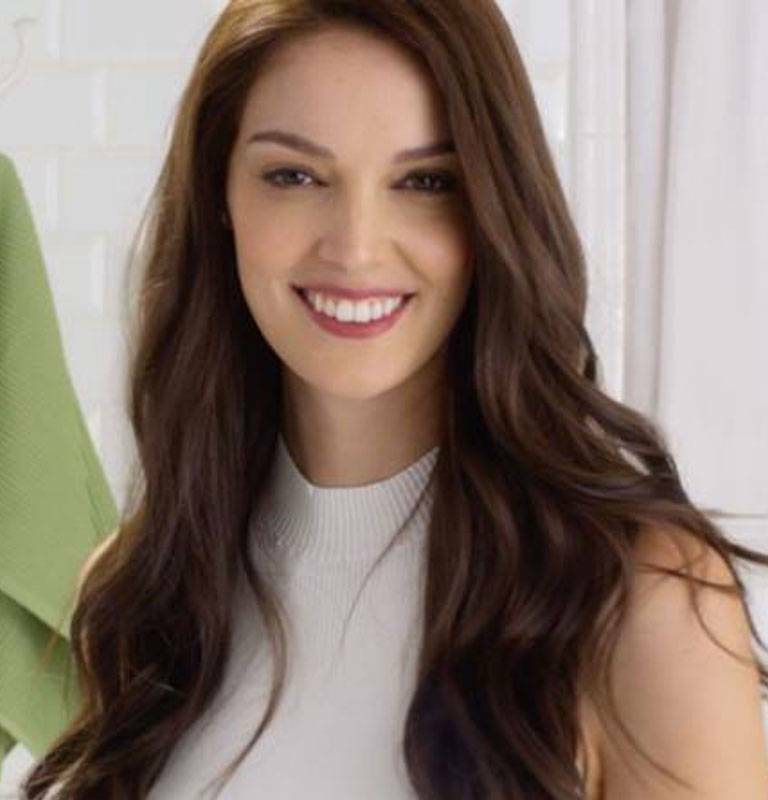 Garnier Nutrisse Deep Chestnut Brown 434 (Chocolate Chestnut) adds warm, reddish-golden tones to your results and also provides 100% gray coverage. 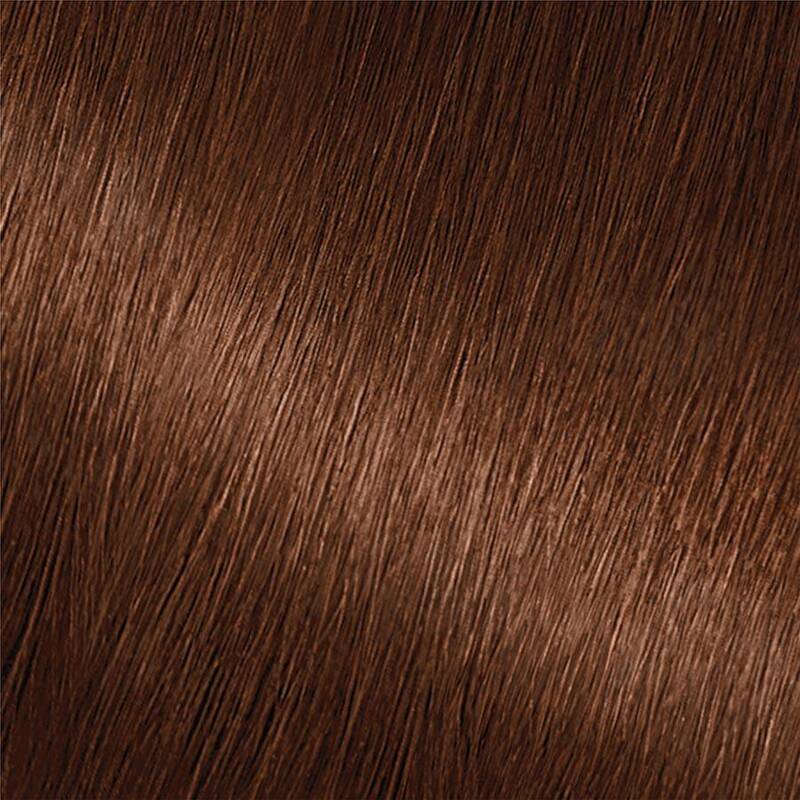 This shade is best for anyone with natural hair between light brown and black. If you prefer a lighter shade that reflects similarly try shade 535 (Chocolate Caramel). For one shade darker, try shade 33. If you prefer to remain in the dark brown range but would like to try other reflects and tones, there are many shades to choose from including 40, 413, 415, 42, 43, and 452. *For women with currently color treated hair, there are special considerations for the color result you can achieve. Because of this, we do not recommend shade 434 (Chocolate Chestnut) for hair that has been previously colored Darkest Brown 30 (Sweet Cola) or darker. For more help, use our Shade Selector Tool to find the perfect shade for you! Nutrisse nourishes while it colors with a rich, non drip creme formula, and with an ampoule of grape seed oil, it smells great while you apply. 6) Extend color through the ends, and massage into hair. 7) Leave formula on for 25 minutes or 30 minutes if you have lots of gray hair or resistant/coarse hair. 10) Apply Nourishing Conditioner (D) and leave on for two minutes, then rinse thoroughly. Nutrisse Colorant: Aqua/Water, Cetearyl Alcohol, Propylene Glycol, Deceth-3, Laureth-12, Ammonium Hydroxide, Oleth-30, Lauric Acid, Hexadimethrine Chloride, Glycol Distearate, Polyquaternium-22, Ethanolamine, Silica Dimethyl Silylate, Ci 77891/Titanium Dioxide, P-Aminophenol, M-Aminophenol, Ascorbic Acid, Sodium Metabisulfite, 6-Hydroxyindole, 2methyl-5-Hydroxyethylaminophenol, 2-Methylresorcinol, Dimethicone, Pentasodium Pentetate, P-Phenylenediamine, Parfum/Fragrance, Carbomer, Resorcinol, Vitis Vinifera Seed Oil/Grape Seed Oil. F.I.L. D35188/4. Fruit Oil Concentrate: Paraffinum Liquidum/Mineral Oil, Vitis Vinifera Seed Oil/Grape Seed Oil, Parfum/Fragrance, Tocopherol, Rosmarinus Officinalis (Rosemary) Extract. F.I.L. D25829/5. Rinse-Out Conditioner: Aqua/Water, Cetearyl Alcohol, Elaeis Guineensis Oil/Palm Oil, Behentrimonium Chloride, Pyrus Malus Extract/Apple Fruit Extract, Glycerin Parfum/Fragrance, Stearamidopropyl Dimethylamine, Niacinamide, Pyridoxine Hcl, Butyrospermum Parkii Butter/Shea Butter, Citric Acid, Olea Europaea Oil/Olive Fruit Oil, Saccharum Officinarum Extract/Sugar Cane Extract, Benzyl Alcohol, Chlorhexidine Dihydrochloride, Persea Gratissima Oil/Avocado Oil, Ribes Nigrum Oil/Black Currant Seed Oil, Linalool, Citrus Medica Limonum Peel Extract/Lemon Peel Extract, Ci 19140/Yellow 5, Camellia Sinensis Extract/Camellia Sinensis Leaf Extract, Ci 15985/Yellow 6. F.I.L. D35637/3. Nutrisse Developer: Aqua/Water, Hydrogen Peroxide, Cetearyl Alcohol, Trideceth-2 Carboxamide Mea, Ceteareth-25, Glycerin, Pentasodium Pentetate, Sodium Stannate, Tetrasodium Pyrophosphate, Phosphoric Acid. F.I.L. D12836/26. A smoothing and silkening hair booster, Avocado Oil is loaded with plant-based fatty acids, which have a unique ability to penetrate for deep long-lasting effects. This rich indulgent ingredient helps to smooth split ends while adding a brilliant shine. Packed with antioxidants, Olive Oil has been a high-performance beauty elixir for centuries. In hair care and hair color formulas it helps coat hair, leaving strands strong, glossy, and resilient. In face moisturizers, it soothes as it smoothes for glowing, youthful-looking skin. Rated 5 out of 5 by Xiomy from The perfect dark chocolate brown! I have spent years searching for the perfect chocolate brown shade and I have finally found it! My hair is naturally dark so after applying this color, my hair turned out to be a dark chocolate brown shade with red and golden tones which is perfect for me. It will appear to be a much lighter chocolate shade on someone with lighter hair. Not only am I in love with the color, I also love it’s none drip formula. I didn’t even need to use anything to hold my hair up since it stayed nicely in place after I applied it all over my scalp and hair. I have also had bad experiences with other dyes, which have left me with an itchy scalp but this one is great on my scalp. I highly recommend this brand and this hair color for anyone who is trying to go for a nice dark brown. Rated 5 out of 5 by CurlyGoals from Such A Beautiful Brown With Dimension. Wow! I love this hair color. I had a few hair color disasters and I wanted a nice brown without too much red. Just a tad. Not too much gold either, just a little bit. This one is it. Seriously. I am African American with curly natural hair and this color is so beautiful to me. It looks so natural. My natural hair is color is a level 2-3 dark brown. So I wanted to go a little lighter. This did the trick. My hair is still darkish, but you can see the brown. My husband keeps complimenting me on my hair. He said it brings out my brown eyes! Awww! It really does. This is the perfect brown. Do not let the description scare you too much. It has a small amount of reddish tones, overall it's a nice chocolate color, perfect for tanned and brown skin. It will definitely bring out your features if you have a warmer skin tone. Rated 5 out of 5 by LucyS from I'm a girl again! So I go dark in the fall and lighten in the summer and I thought I would like to see what this colour would be like on me. Not only did this cover all my grays 100%, but it left it covered beautifully and completely luxurious to the touch. My husband commented on the colour of which never happens. "That's the color I met you with and fell in love with you ". SERIOUSLY! ! Guess who's keeping the colour forever. Not just because if what my Bill said but because it's actually a lovely deep shade that has lovely dimension. Rated 5 out of 5 by JojoMo from Covers Gray! I was skeptical but the product does in fact cover grays. I have the darkest color on the spectrum (black hair, so even a few grays stand out strongly in contrast) and there was actual change in color to my black hair. I got more of a deep dark brown. But what was most impressive was that my grays did pick up the color and they were covered. I have yet to wash my hair so I'm still not sure how over time the color will do, but I was so happy it did cover gray!